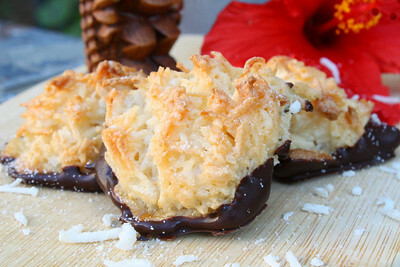 Knowing that the dishes weren't going anywhere, I turned my back on them yesterday and quickly whipped up one of our favorite treats, Chocolate Dipped Coconut Macaroons. Better the day after they are made, these little coconutty mounds are year round treats in our household. Minimal ingredients and effort have them ready for the oven before it reaches its preheat temp. About an hour later a quick dip in a few ounces of melted chocolate finishes them off. Bursting with coconut and therefore the essence of any tropical location, our Coconut Macaroons just might ease your Island Fever. 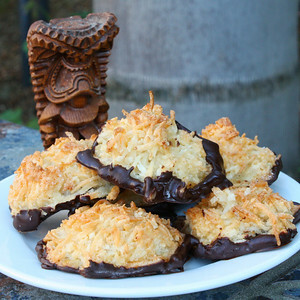 In addition they will make a lovely tropical addition to your Holiday Cookie Tray! In a large bowl whisk together the egg white, sugar, salt, vanilla and almond extracts. Add the citrus zest if you are using it, stir. Add the coconut, stirring well to coat. Line a baking sheet with a silicone mat (may use foil if you don't have a mat, but be sure to butter the foil). Spoon small scoops of the coconut mixture onto the mat (I usually get 7-8 macaroons) about 1 inch apart. Place into the preheated oven and bake until the tops of the macaroons are golden - about 15 minutes. Begin checking at about 13 minutes and watch closely as the coconut may burn easily. Chop chocolate into small pieces and place in a double boiler over low heat on the stove, stirring often until melted. When chocolate is melted, dip the bottoms of the macaroons into the chocolate and place on a waxed paper lined surface. I pop mine into the fridge to set, and then bring to room temp to serve. Note: Taken out just as the tops turn golden, the macaroons will a little "mooshy" inside. I prefer mine a bit dryer with the tops more brown that golden. But the choice is yours... Aloha! These look sooooooooo good. I want some! My dad ADORES coconut macaroons but I know has never had them dipped in chocolate so this is a perfect thing to send his way for Christmas. Thanks for sharing them. Wow these sound wonderful! Haven't made holiday candy for years. These are definitely a must try! These look delicious. Hope you can come back and visit the islands soon. We can go to my other favorite restaurant 12th Avenue Grill, or maybe Alan Wongs. YUM! They look awesome Kim! I've never made these from scratch but I am VERY excited to try! My other half and my stepson are not wild about coconut so you know what that means...I get to eat MOST of them! These look incredible! So easy to make too! I want one right now!! I love macaroons and dipped in chocolate just brings them to a whole new level. Yummy!!! These look great. You have the perfect island accessories to keep you in the Hawaii mood, and not to mention the beach! I checked out the Cbad farmers market this week. They have vegan tamales!!! I flipped when I saw them. Totally wasn't expecting that, but was happily surprised. Dont you just love Coconut Macaroons. Looks delicious. 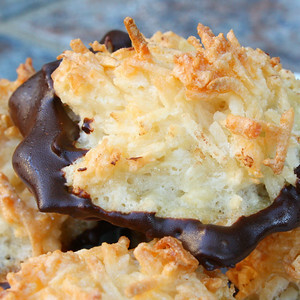 I made once coconut macaroons and it was a complete disaster and since then the only macaroons we have are the store bought ones. yours look so great, and dipped in chocolate, bet they tasted delicious.